On Wednesday, September 17th, ‘Scout’ (a.k.a. ‘Salty’) died from colic (a twisted gut) while in my care at my Cody ranch. Scout was born in 2013 in the Salt Wells HMA (one of the Horse Management Areas in Wyoming) – he was barely even a year old. He was a timid soul who found the Untouched Horse clinic difficult. Though he received the best of training, patience, and respect, he just couldn’t quite connect with his handlers and this new domestic setting. So by the end of the clinic he remained virtually untouched. These situations weigh heavy on my mind. 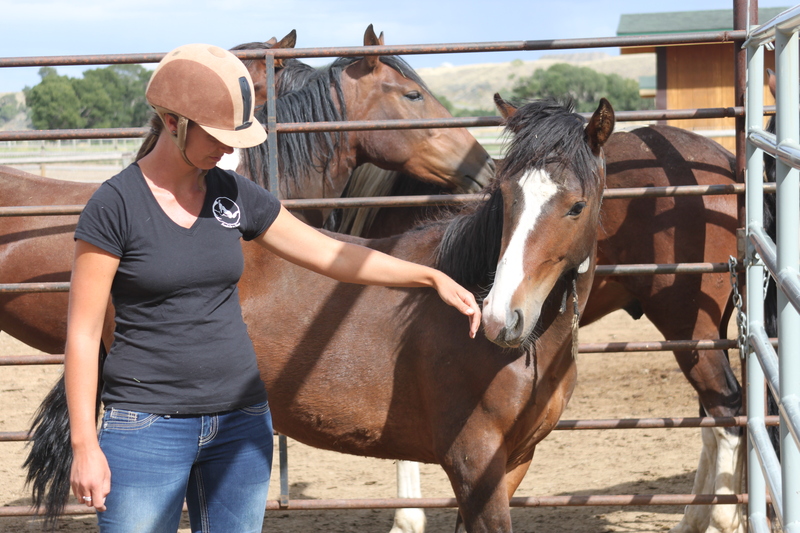 For the last five years I have signed an agreement with the BLM to foster gathered mustangs, provide for their proper care, arrange for their training, and attempt to find them homes with qualified adopters. To date, over 30 mustangs have come to my ranch and participated in Anna’s Untouched Horse clinic. During this clinic they learn those valuable skills which allow them to successfully transition from wild to domesticated life. The program has been so successful that this year a Wyoming BLM manager practically begged me to take more than the 6 mustangs that I signed up for… which made me chuckle because in the past major hurdles had to be jumped to get the fostership going. You might wonder what happens to them between the time they are rounded up from the range (by either helicopter chasing or bait trapping) and the Untouched Horse clinic. This is where my knowledge starts – at the BLM holding facility in Rock Springs, WY – where I select several horses each year from amongst the 700+ living – or more accurately ‘existing’ – there. Once they’ve been hazed into the loading chutes and my trailer I make the 5 hour drive back home and unload them into my corrals, giving them a month or more to acclimate to their new environment. While my ranch is a quiet peaceful place, I can tell that stress remains with some of them for quite a while. In the first year, almost all the mustangs had diarrhea and snotty noses (and I was glad that they were in an area isolated from the rest of my herd). Sand colic almost took the life of my dear mare ‘Topa’. I discovered that mustangs have the tendency to ‘vacuum’ up every bit of hay from the ground (along with the grit underneath). In the wild, they graze on standing grass and are constantly moving, especially in arid, desert-like terrain where forage might be in short supply. When offered cut hay tossed on the ground, they stand still and eat everything in front of them so sand colic is a very real threat to their health. That same year ‘Radar’ resorted to cribbing and wind-sucking to sooth his nerves. Then there was a year when all the horses chewed on each other’s tails. Sadly, some mustangs never settle in, which can be said of the mare ‘Mariah’ and this little gelding ‘Scout’. But I will forever be in awe of the mustangs’ ability to adapt to their new surroundings. By the time the annual clinic starts nearly all are ready and willing to learn the lessons presented. So now I ask myself, “Can something be done to more quickly ease the stress they feel upon arrival?” Homeopathic sprays such as Dynamite’s “Tranquil” and “Relax”, as well as Bach “Rescue Remedy” are certainly possibilities since they can be given in the water and do not involve touching the mustangs. Non-invasive healing techniques such as Reiki should also be considered. Finally, as a tribute to Scout, I would like to encourage each reader to consider adopting a gathered mustang and supporting the efforts of those fighting to keep America’s mustangs wild and free on our ranges. There are over 50,000 horses in holding facilities across the nation and my story about Scout should not deter you from giving one of these beautiful animals a loving home. In my experience Scout is the exception, not the rule. Through Anna’s trust-based training which teaches the language of Equus and help from the above-mentioned healing modalities, adopted mustangs can grow and thrive as wonderful partners, capable of enriching a caregiver’s life with joy and wisdom. As for the mustangs still in the wild… well, they’re just healing for the soul.